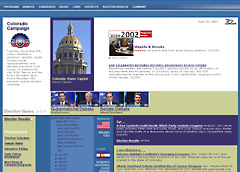 Colorado Campaign is an election website with the primary purpose of providing voters with election news and information. Rocky Mountain PBS partnered with KCNC-TV (Denver CBS affiliate) and the Rocky Mountain News to offer special election coverage on-air and online. 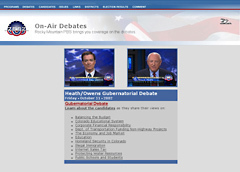 Political debates between candidates of key races were broadcast on television and streamed on the website. Proposed amendments were presented in both English and Spanish for the multi-cultural audience in Colorado. Brief summaries and supporting materials made it easier for voters to understand these initiatives. Streaming NewsHour reports helped to provide a national perspective on local issues, as Colorado voters could see how similar issues were handled in other states. On November 5, live reports, commentary and election results were broadcast on-air. 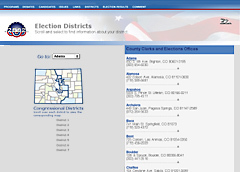 Viewers directed to the website received continuous election updates. Anticipation grew as candidates and voters in the hotly contested 7th Congressional District waited until the following day to find out who won the close race between Republican Bob Beauprez and Democrat Mike Feeley. and the Rocky Mountain News on local news. Online NewsHour provided national election news.